Provides quick, touch-less, on-the-go application to relieve itching, burning and stinging without the use of steroids. 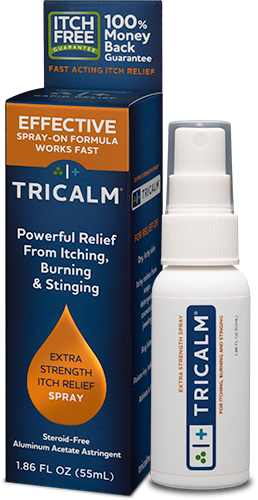 TriCalm Extra Strength Spray provides quick, touch-less, on-the-go application for extra strength itch relief for bug bites, poison oak and ivy and minor skin irritations. Can I apply it to broken or abraded skin? As with any skin care product, care should be used when applying TriCalm to broken or abraded skin, as temporary stinging may occur. TriCalm is not an anti-infective and should not be used to prevent infection. Does it sting when applied? If TriCalm is applied to extremely dry, open, or abraded skin, you may experience a temporary stinging sensation. This is due to the presence of a salt compound in TriCalm and is not harmful. If the stinging is too intense, wash TriCalm off the area with mild soap and water. For what conditions can TriCalm be used? 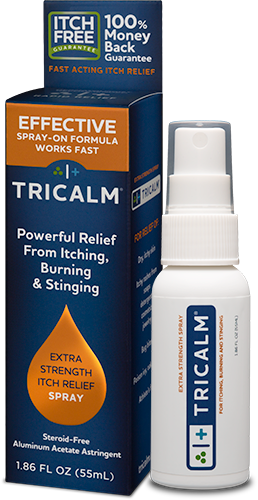 TriCalm provides rapid relief for minor skin irritations due to poison ivy, poison oak, poison sumac, insect bites, athlete’s foot and rashes caused by soaps, detergents, cosmetics or jewelry. What is the Itch Free Guarantee? We’re so confident that TriCalm will relieve your itch, we’re backing your purchase with our 100% money back guarantee. If TriCalm doesn’t relieve your itch, send us your unused TriCalm portion, sales receipt, name and return mailing address within 90 days and we’ll give you a full refund. See details at See details about our itch-free-guarantee.